Take 4 capsules daily. For maximum tissue saturation take 4 capsules twice per day. 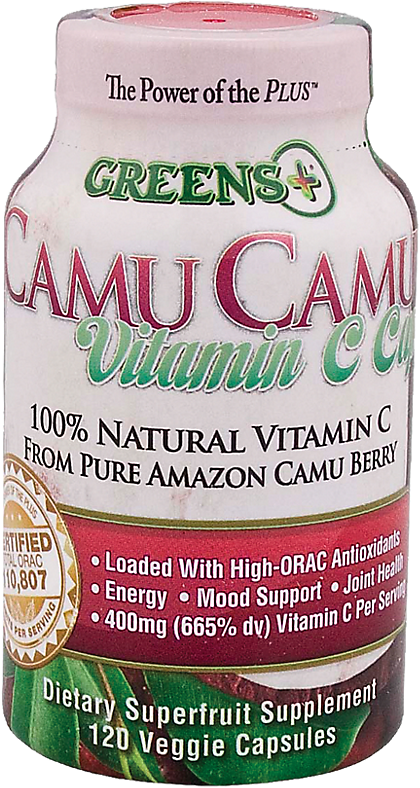 Greens Plus CAMU CAMU contain 100% Pure Camu Berry Fruit and Juice Powder from the Amazon. 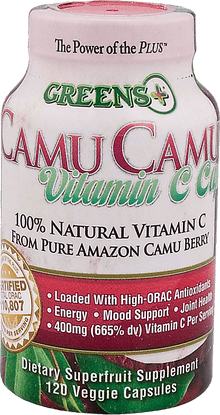 Camu Camu contains the highest concentration of natural Vitamin C, with 15% Ascorbic Acid and over 70 synergistic antioxidants, essential minerals and amino acids, including Calcium, Potassium, Phosphorus, Beta carotene, Alanine, Phenylalanine, Serine, and Ellagic, Citric and Malic Acids. These synergistic phytonutrients combine to deliver a massive 110,807 Total ORAC units per serving.